Users Insights doesn’t require any technical knowledge in order for you to be able to analyze your users data. Normally, in order to get some insights from your WordPress users data, you would have to dig into your installation database, write some complex SQL queries, and then try to make sense of all of the data. Moreover, if you want to get some additional info about your users, like their locations or their activity, you would have to use some third party solutions. Usually, that would require adding some complex scripts to your site and using different systems in order to be able to extract any valuable information. Users Insights is made for WordPress. The plugin integrates seamlessly into your WordPress installation and doesn’t require any complex setups. 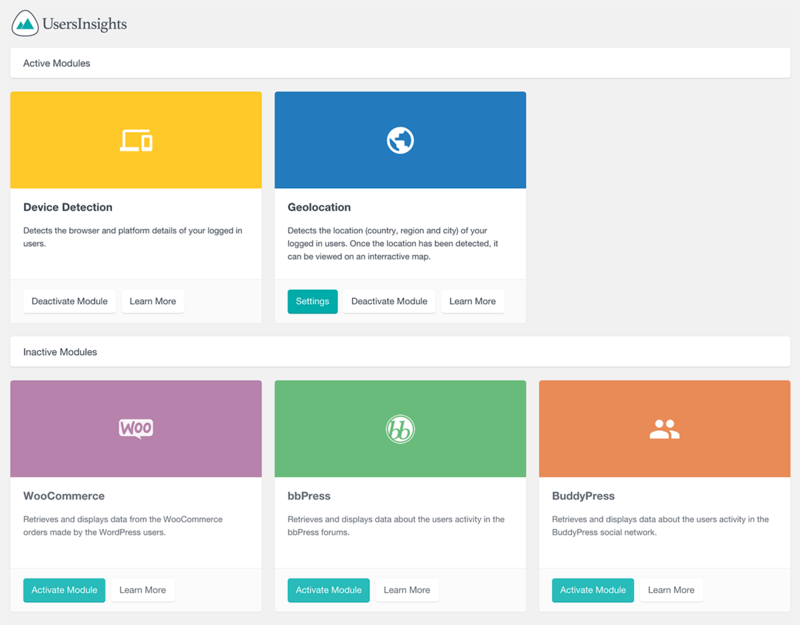 All you need to do in order to start working with it is to install the Users Insights plugin to your WordPress site. The process of installing the plugin is the same as you would install any WordPress plugin. Once installed, Users Insights works out of the box. You can immediately start applying filters and analyzing your users data. Moreover, the plugin will instantly start to gather additional data about your users like their activity, locations etc. The longer you have Users Insights active on your installation, the more data you will have to work with. The Users Insights plugin comes with different modules that you can activate/deactivate depending on your needs. For example, if you use WooCommerce for your shop, you can activate the WooCommerce module to track what products your users have purchased or their orders number. You can activate/deactivate modules via the modules section of the Users Insights plugin. Please note that for the modules that track and gather information about your users, such as the Geolocation and the Device Detection module, they will need to be active in order to be able to aggregate this information.